HIGH temperature resistant and hydrogen resisting CrMo(V) steels have been around for a very long time and have found use with great success for applications in the petrochemical and the power generation industries. 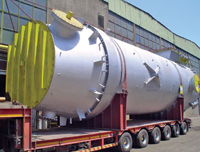 Typical products for these industries are heaters, heat exchangers, reactors, and hydrocrackers, usually build as heavy wall pressure vessels (up to 350 mm wall thickness). In a continuous strive for optimising the economics in the various process installations in these industries, the service pressures and/or temperatures have increased. This implied that the respective base materials either had to be made available in heavier thicknesses or they had to be developed to meet higher strength and impact toughness requirements. Increased mechanical properties will reduce or at least restrict the necessary wall thickness which generates an additional economical advantage in production, handling and installation of heavy process equipment. The basic and classic CrMo steels are alloyed with 0.5 per cent Mo – 1 per cent Cr/0.5 per cent Mo – 2.25 per cent Cr/1 per cent Mo – 5 per cent Cr/1 per cent Mo – 9 per cent Cr/1 per cent Mo and 12 per cent Cr/1 per cent Mo. From these steels further development has taken place by adding elements as V, W, Ti, B and/or N to arrive at the new grades of today such as the T/P 22V, T/P23, T/P24, T/P91, T/P92 and T/P122. Many of these new grades have been applied successfully in industry but the development continues. Obviously the development of the welding consumables had and has to follow the direction of the base materials with the assurance of meeting the same stringent requirements for the process equipment as the base materials. Even more so, because the HAZ is usually also considered as being part of the weld. Extensive research and development (R&D) has taken place at Bohler Schweisstechnik in Germany to arrive at a full consumable range for the new generation of CrMo(V) steels for which also creep data up to 60.000 hours for the power industry has been determined. With increasing alloy level the specific welding procedures have to be adjusted and will require for more precise and strict control of welding parameters and heat treatment.